- More proof that a slimmed down Hunter Morris is a better Hunter Morris. On Friday, he started the Tigers scoring with a triple. Only his second of his career. -Some problems that seem to be fixed include Auburn's error situation (none on Friday, 2 on Saturday and Sunday). Sure, no errors are better than 2, but its still a marked improvement from last weekend. -The bullpen is making some solid improvements. Namely, Zach Blatt. Blatt is shaping himself up to next years closer, and if he keeps putting on performances like last Friday (2ip, 2k, 0b,0h,0r) then Auburn fans have something to be excited about. From when I've seen him, Blatt seems to thrive in those high pressure situations and not fold. -Hunter Morris is slumping a bit. Well, slumping is a harsh word. More like a power drought. I'll blame it on the weather for now, but he's yet to hit a HR and seems a bit frustrated at the plate sometimes. It could also be his new found contact philosophy. After this latest cold front blows through, Auburn should be getting pretty warm, let's hope Hunter does the same. -Kevin Patterson is stuck in a logjam. He's only played in 2 games this year. One (the opener) was forgettable and the second (Sunday) was outstanding: 2 for 3 with a HR/2bb/0k. I'm not entirely sure why Wes Gilmer has been DHing. Especially with Gilmer struggling lately. If KP seriously struggles so much against LHP that a better option is a guy who went hitless this weekend (Gilmer) then there is only one solution, play KP against LHP more to get him the experience. When Mummey gets back in the lineup, then that will probably push Tony Caldwell out of his stopgap role in RF. TC is just as valuable as KP. It's a struggle Coach John Palowski will have to work out. -Jon Luke Jacobs has to fix whatever he's struggling with. 2 sub par starts on Friday are not going to cut it during SEC play. In my opinion, this Friday against Miami (OH) is his put up or shut-up outing. If he can't get out of the 5th inning against a mid-level MAC team, then it might be time for some bullpen work. 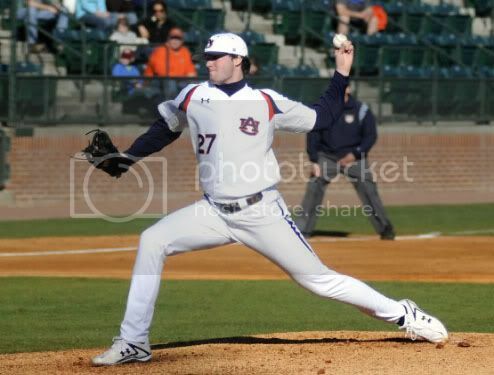 -Slade Smith, probably the future of Auburn's pitching staff, made his debut on Saturday. His line: 2ip/2h/3k/0er. Pretty nice debut. -Speaking of good debuts, Cole Nelson continues to amaze. Another solid outing: 6ip/6h/1er/2r/1bb/12k. That's right, 12 strikeouts against Florida Atlantic. In 14 plate appearances over the weekend, Fletcher had seven hits, two walks and was hit by a pitch, driving in 11 RBI to give him 17 on the season in just six games. He has now hit safely in all six games this season and has an 11-game hitting streak dating back to last season. The Hitter and pitcher of the weekends should be pretty obvious.